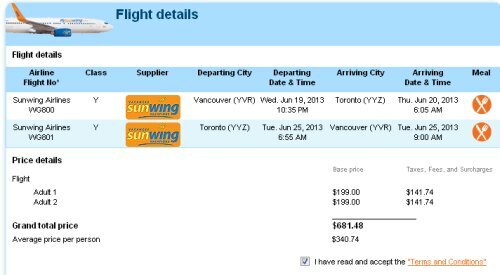 Charter airline Sunwing is showing some flights in June from Vancouver to Toronto for $340 roundtrip after taxes. If you've tried to fly between Vancouver and Toronto in the past few years you know that airfares on our nation's two major airlines don't like to drop below $575 roundtrip after taxes between these two cities. It's nice to finally see a fare that's 40% cheaper! UPDATE @ 11:30 PM - Looks like the verified price is now coming up as $486. Hopefully Sunwing will add some more cheap ones. 3. Search for a flight between Vancouver and Toronto, departing June 19 and returning June 25. Sunwing's Vancouver/Toronto flights are the only Western Canada to Eastern Canada flights that are not operated by Air Canada or WestJet. vancouver, yvr, sunwing, flight deals, toronto, ontario, yyz and canada. One Response to "Vancouver to Toronto | June flights for $340 roundtrip after taxes"
The deals not coming up, any suggestions?